The classes are playful and engaging, it's 45 minutes of fun for everyone. Each week, I lead a thoughtfully designed and energetic class. Everyone sings and enjoys musical activities with songs ranging from sweet lullabies to boisterous jams. 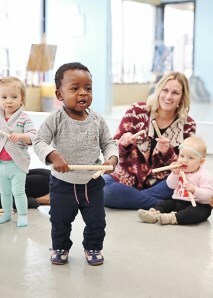 Children participate in their own time, creating a symphony of variety from their mixed ages and abilities. The rich music environment supports each child's overall development. Live and active music making is the heart of my class. I play the guitar and guide everyone through instrumental, physical or rhythmic activities. Everyone gets their hands on age appropriate instruments. Class size is strictly limited to ensure that all the parents and children who come together enjoy a warm and supportive atmosphere family-like atmosphere. Music Together classes include tools and resources you need (songbooks, music files, apps, tips & guides) to continue the music making at home and all the time. Music Together offers diverse songs for all ages (even you!). There is a different song collection for each season, with engaging songs in a wide variety of tonalities, meters and cultural styles.